I love travelling because it gives me the opportunity to experience cultures, traditions and local food which we don’t get very much nowadays in urban Singapore. The other reason why I love travelling out is because I love visiting their markets! Soaking in the sights and sounds, smells which are familiar and yet exotic at the same time, market visits are always full of surprises and hence, much anticipation! Market visits allow me to “sample” what the locals eat, and how they are different from what we get here in Singapore. And even with the same ingredient available here, varieties may differ which makes it so interesting! 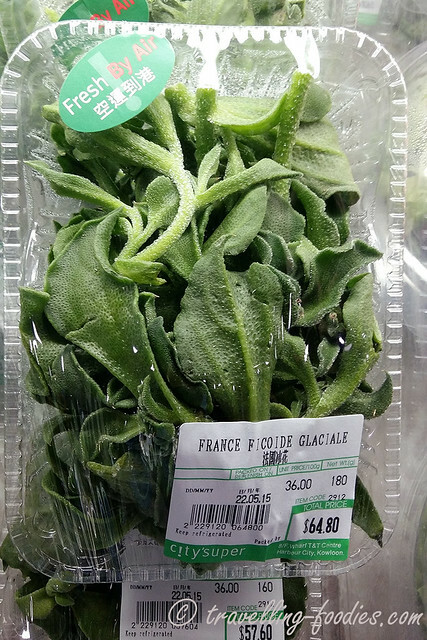 In our most recent trip to Hong Kong, we chanced upon a vegetable which I’d not seen before, Crystalline Ice Plant aka Ficoïde Glaciale (Mesembryanthemum crystallinum) which is often dubbed as 冰花菜 or simply 冰菜 in Mandarin as its scientific name 冰叶日中花 is simply too long! I saw this vegetable being cooked on an online TV show shared by my friend Hody and got very curious to how crunchy (脆口) it is, even after cooking. Thankfully we managed to spot some at one of the local supermarkets and promptly put a punnet into our shopping basket. It stores remarkably well and were still good despite being a few days since we bought it. 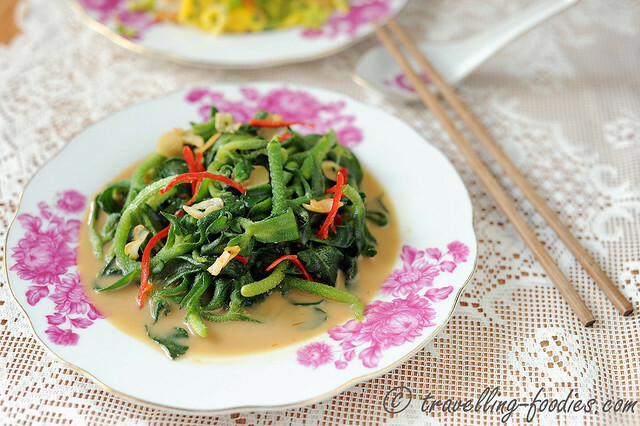 Probably slightly passed the prime to be used as a salad vegetable as what it is commonly used, so I cooked it the style which I would normally do for a quick water convolvulus aka kangkong stirfry. Not surprisingly, the 腐乳冰花菜 Crystalline Ice Plant with Fermented Beancurd turned out really yummy! The ingredients are very simple for this quick stir-fry. 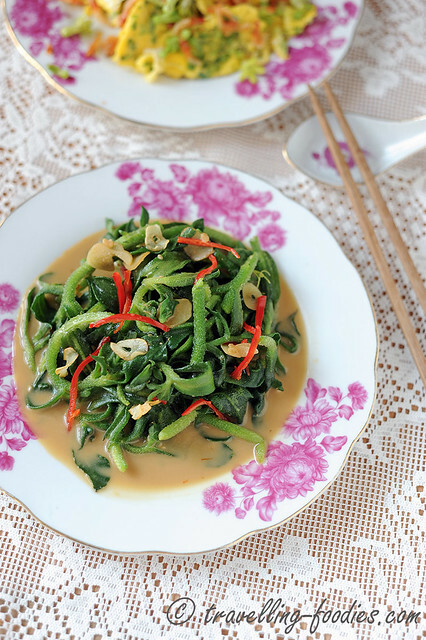 This is typically how the Taiwanese would enjoy their water convolvulus aka water spinach, known in Chinese as 空心菜 but colloquially as 雍菜 “eng chye in Hokkien or 通菜 “tung choi in Cantonese. It requires very little ingredients but the flavours are really lovely. 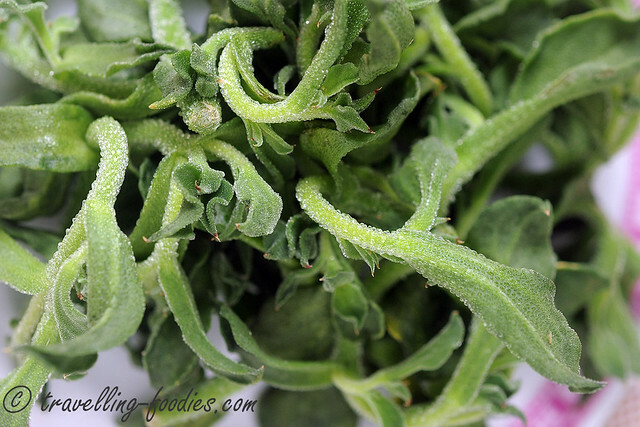 In place of kangkong, I’d used the crystalline ice plant instead. Despite their name, ficoide glaciale are actually native to Africa and Southern Europe (probably why it can also be found in France where this batch was cultivated), not to mention the hot and dry Sinai Peninsula. It gets its name from the beady bladder cells found all over the plant, most notably on the stems and undersides of the leaves which allow the plant to store water, making it a succulent and hence very crunchy! The mineral salt deposits within the bladder cells also lend the leaves a slightly savory taste which makes it an excellent salad green without having to add much dressing! But instead, I’d chosen the quick stir-fry method which allowed me to whip up a dish in less than 5 minutes with just a few ingredients! Very delicious! In a heated wok, add cooking oil and pan fry garlic slices until golden brown and crispy. Drain garlic slices and set aside but leave the garlic infused oil in the wok. Add sliced chilies and stir fry a bit before adding fermented beancurd slurry and stir fry until fragrant. Add sesame oil and turn off the flame. Add crystalline ice plant and some garlic slices. Toss to slightly wilt the ice plant with the residual heat. 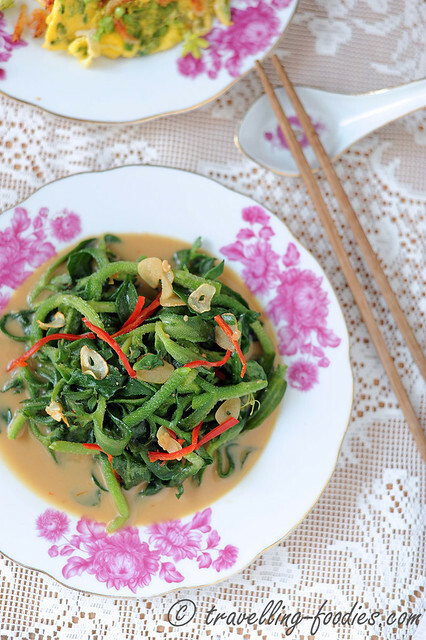 The undulated surface of the ice plant leaves and stems allow the fermented beancurd sauce to cling on really well. Serve immediately with other dishes and enjoy with steaming white rice. This entry was posted on June 9, 2015 by Alan (travellingfoodies). 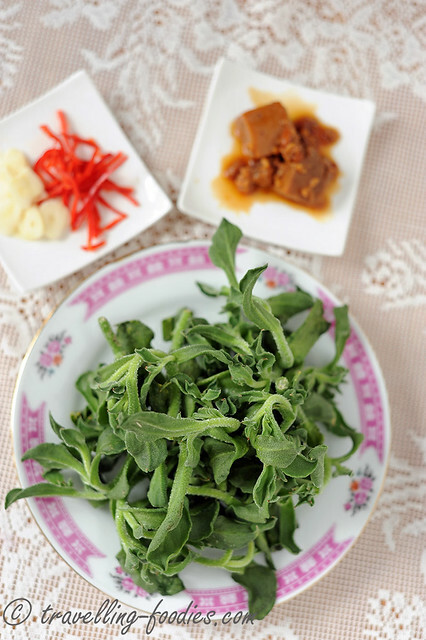 It was filed under Food, Simple Eats and was tagged with crystalline ice plant, 腐乳, fermented beancurd, Ficoïde Glaciale, Mesembryanthemum crystallinum, 冰花菜, 冰叶日中花.